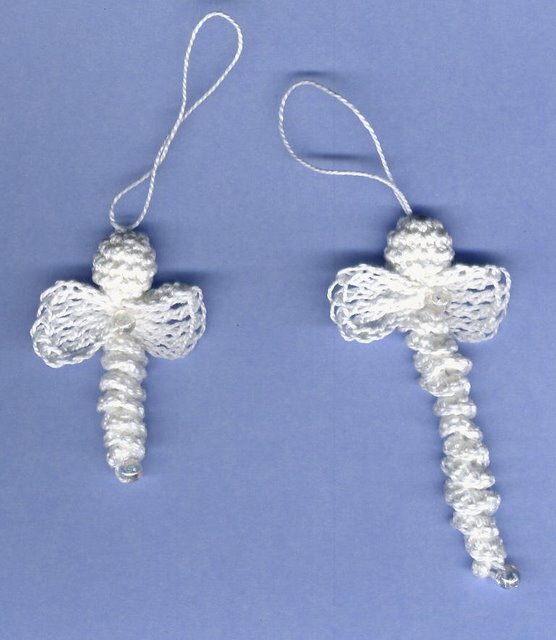 If you are using a bead to decorate the end of theicicle put it on your thread now. 6 single crochet in the second chain from hook. single crochet 2 together around until 4 stitches remain. slip stitch next single crochet, skip 1 single crochet, slip stitch the next stitch together with the first slip stitch. now work 4 single crochet in each chain, to last 2 chains. *chain 5, work 5 double triple crochet in the 1st chainof the chain 5, slip stitch in the same chain as thebeginning of the chain 5, repeat from * end off leaving the thread long enough to feed through the angels head and be able to create the hanging loop. If you want to have a bead in the middle between thewings thread it on now, and secure it there. After that is done pull the end of the thread up through the angels head.Create the loop, secure. I just wound the thread around another stitch. It didn't need a knot. Feed this end back through the head of the angel, cut it off so it does not show.